Ben Townsend won the latest £1,000 Grand Final qualifier on the Jay Lake at Rookery Waters with 52 carp weighing 156lb 10oz. 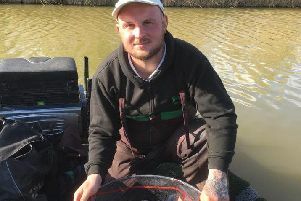 Runner-up was Lee Thornton, who booked his place in the August final with 121lb 12oz. Graham Welton came third with 108lb 14oz. Fenland Rods Rookery Waters, Jay Lake: 1 John Garner 70lb 4oz; 2 Mac Campbell 67lb 6oz; 3 Kev Lee 64lb 13oz. Float Fish Farm Over 60s: 1 Jeff Tuttlebee 115lb 10z; 2 Ted Rowe 97lb 8oz; 3 Alan Wiggins 86lb. Tydd Gote AC, North Level Drain, Thursday: 1 Colin Gibbons 3lb; 2 Andy Greenwood 2lb 8oz; 3 Andy Harrison 2lb 2oz. Tydd Gote AC, North Level Drain, Sunday: 1 Dave Williams 7lb 14oz; 2 Ray Groom 6lb 7oz; 3 Paul Spriggs 4lb 6 ½.
Decoy Lakes, Six Islands: 1 J. Brooks, Middy, 261lb 9oz; 2 J. Whincup, Frenzee, 188lb 10oz; 3 S. Godfrey, Decoy, 188lb 2oz . Webb’s AC, Kingsland Fishery Silver Lake: 1 G. Harmer 29lb 11oz; 2 A. Forrest, 21lb 10oz; 3 K. Allum, 20lb 11oz. Haddon Lodge: 1 L. Melillo 24lb 14oz; 2 L. Melillo Junior, 20lb; 3 T. Moulds, 18lb 14oz.